I can't find our camera. It has gone missing so here is my artists interpretation of what I look like this week. 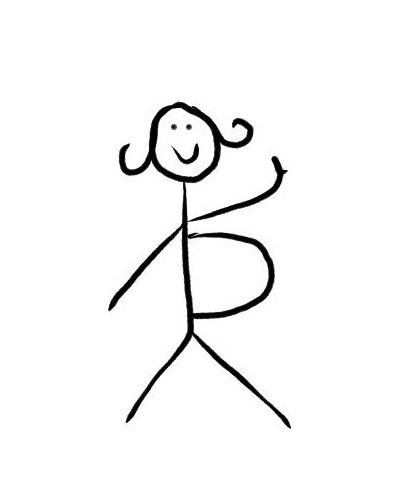 No joke I have what appears to be a basketball in my belly. How far along? 39 weeks. One week to go!! Where she is: 3/5 engaged with her head firmly stuck in my pelvis. Facing towards the left. Feeling: So so excited. This little girl could come at any time and I am looking forward to her so much. Movement: She goes nuts in the evenings. She loves it when we put our hands on my belly. She wriggles about and pokes her little body parts out. Sleep: Great! Getting a bit of heartburn but pretty much sleeping all through the night. Symptoms: Feeling humungous, sore pelvis, heartburn and swelly feet. But feeling great! Labour Signs: Braxton Hicks making that bubba head get engaged. Nothing else to report though. Best Moments this week: Baby shower. It was so lovely. What I miss: picking things up from the floor. What I am Looking forward to: Sweet baby girl in my arms! Milestones: One week till I'm due! How's about a little click click?